Lunchbox notes are a simple way to remind your child you are thinking of them when they are at school. These free printable notes are a great time saver! Summer is winding down and all things ‘back to school’ are slowly creeping into mind. The preparations are beginning. Early bedtimes to get back on schedule and new school clothes and supplies being bought here and there. I know that another preparation is in need also, lunchbox notes. Hi everyone! This is Mistie from Homespun Engineer (This site is no longer available) here today writing about one way I get ready for back to school. Two years of experience and practical preparation have taught me that the best way to never forget a lunchbox note is to produce and print them ahead of time. Some days I’m a good little Mommy. I make my son’s lunchbox up the night before and can write a sweet note on a scrap of paper. Other mornings, I’m chugging a cup of coffee while tying a shoelace and making a sandwich. If you have those mornings, then having these notes printed and prepared ahead of time can be a huge help. 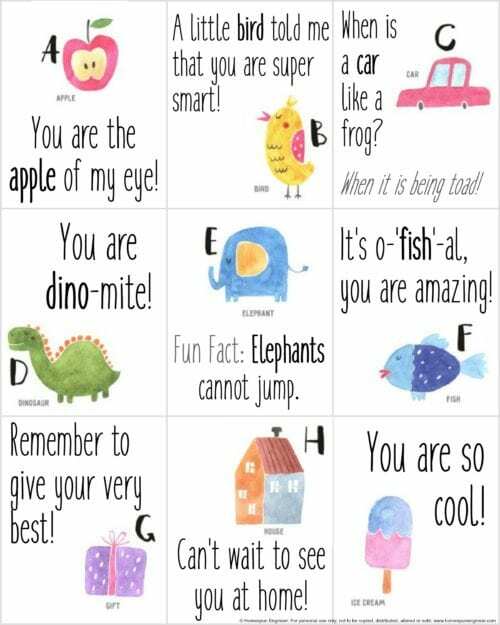 These Lunchbox notes are great for kids preschool to grade 2. They feature the alphabet letters and keywords in bold. 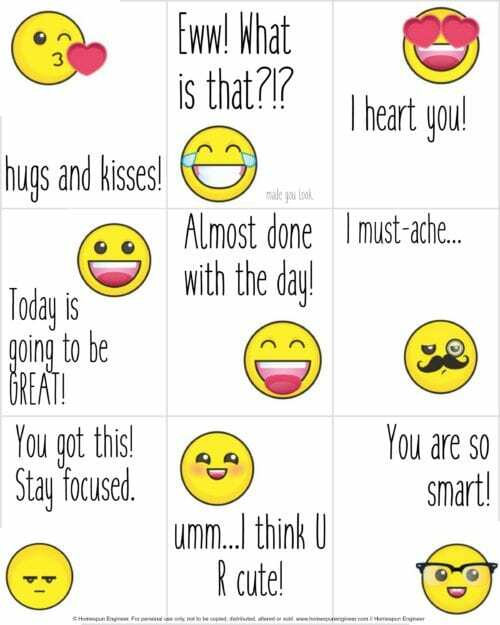 For older kids, check out these emoji notes. Be sure to print out these cute little notes for your love and cut along the gray edges. I keep a stash stored in a kitchen drawer to quickly pull out and put in a lunchbox. What is your favorite childhood movie? Share and leave a comment below! 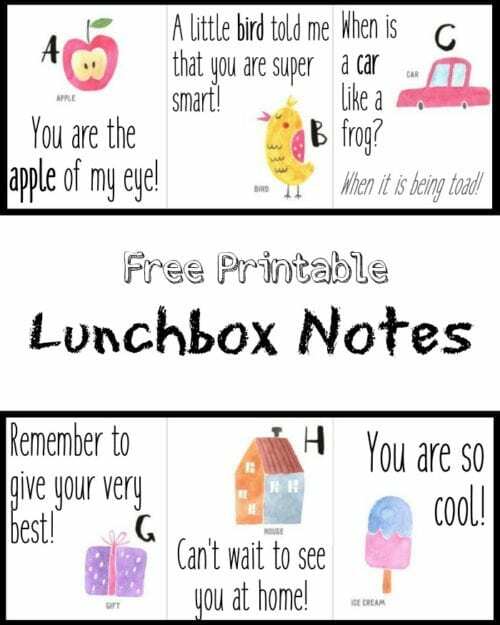 SAVE FREE PRINTABLE LUNCHBOX NOTES TO YOUR FAVORITE PRINTABLE PINTEREST BOARD!